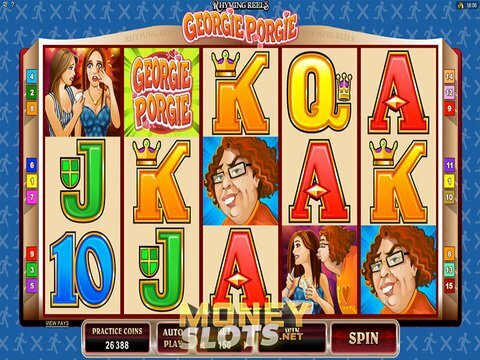 The Rhyming Reels series from Microgaming is one of the most popular slots sets of all time, and the Rhyming Reels Georgie Porgie slot machine is certainly one of the best. Though the graphics aren't the best, the gameplay certainly is across the five reels and 15 paylines. Watch Georgie try to get popular with the ladies with the no download, no registration Rhyming Reels Georgie Porgie free play slot demo that we've made available right here on this page. If you're on the go, be sure to check it out on your mobile device. This title was created for budget gamblers with a betting range starting out at just a penny and topping out at $15, but the jackpot is quite nice at $7500. There are plenty of features to entertain you, as well, and they're all related to the famous children's story. Georgie himself is the wild and will substitute for other icons, and the Breath Spray acts as the scatter to provide you with up to 25 free spins. You'll want to look for the multiplier symbol to win big here, though, and that's Georgie himself! He can pay out as much as 25x during the free spins, and that's something that you won't want to miss. If you get another Breath Spray while the feature plays out, then you'll earn yourself another free spin, too. Another title that is based on childhood tales is Monsters in the Closet which is also from Microgaming. There are five reels and 50 paylines filled with all kinds of cute but creepy monsters, and you can win up to $4000 in a single spin. Free spins are available here, but the real money comes in the bonus round, triggered by the Skeleton Key, in which you choose closets to open. If there are monsters behind the doors, you'll get up to 75x the triggering bet!